While Douglas was visiting Austin, TX so was Grumpy Cat! 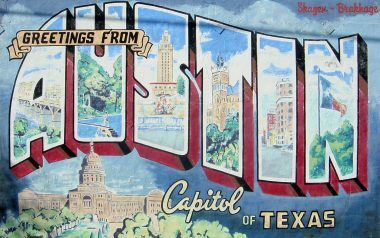 Currently, Douglas is working on residential murals around Austin, TX. There are some plans in the mix and he might be hanging around for a performance in SXSW and other events. Hire him while you can for your corporate event, a 3D drawing, or a trompe l’oeil mural. This PIA Painting™ depicts the Creep from Pete Schuermann’s film Creep. http://www.creepfilm.com/ What is painted and what is not, that is the question?! Corepower Yoga Mural gets some press! 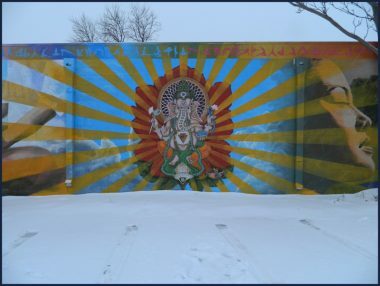 Thanks to the Colorado Springs Independent for highlighting the Corepower Yoga mural. 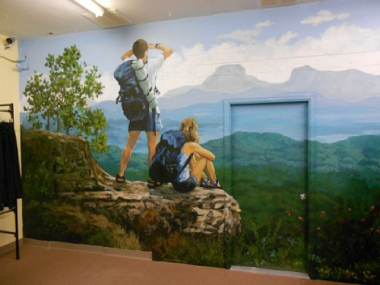 This mural was completed in November 2011 and is still as fresh and energizing as can be. The Space Foundation is located in Colorado Springs, CO. This mural by Douglas Rouse greets you as you enter the new headquarters. 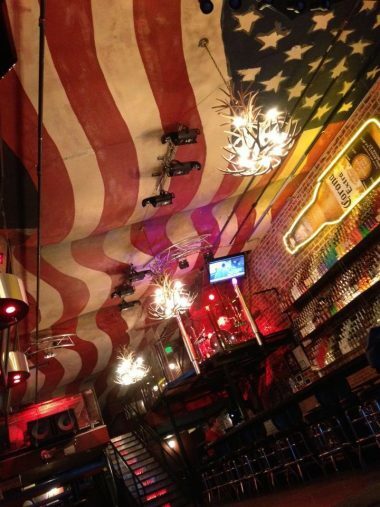 American Flag Mural NEW Pictures of the Completion!! Here is the final picture, the flag is complete!! The American Flag waving in the wind has made Gasoline Alley come to life. Located on Tejon Street in Colorado Springs, CO. 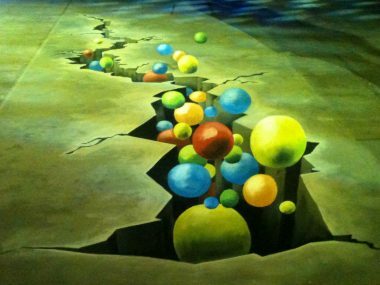 This anamorphic chalk drawing was created for the Denver Chalk Art Festival. The kitschy flamingos, the beautifully executed eyes and the green lawn were a fun surprise to viewers at the festival. This mural is located in downtown Colorado Springs and on a major off-ramp from I-25 creating a visual treat as you enter town from Cimarron. 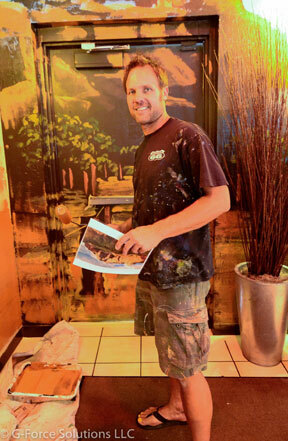 This project was created for local restaurant and bar in Colorado Springs called Shuga’s. The box truck has been disguised as an origami folded art piece. The restaurant will be using it as “Portable by Shuga’s” a moving food truck. 2012 APSCU Conference in Las Vegas, Douglas performed 4 speed paintings of Albert Einstein in the trade show booth for Northstar Learning. Two of the four paintings were then raffled off to Northstar’s potential clients.